Fit for a king, no? Actually more like an emperor. Today was spent wandering the never-ending display of Russian opulence that is the Hermitage and the Winter Palace in St. Petersburg. And the sad thing is, words can’t begin to describe the sensory overload that comes from being plopped down into Russia from the deck of a finely crafted danish cruising boat. And the truth is, photos can’t do it either. Maybe it’s because everything is bigger and more over the top than I originally thought anything could be. Even the urn pictured under the gilded ceiling of the Hermitage is about 10 feet tall. Everything is 10 feet tall. And 10 times more of everything than any rational person would think possible. Can you see the cold Russian night being illuminated by hundreds of twinkling candles reflecting off thousands of cut crystals? I can. This sunlit gallery is dedicated to all the badass and well-dressed Russians that sent Napoleon back to France. Kinda like the Football Hall of Fame in Canton, Ohio, no? 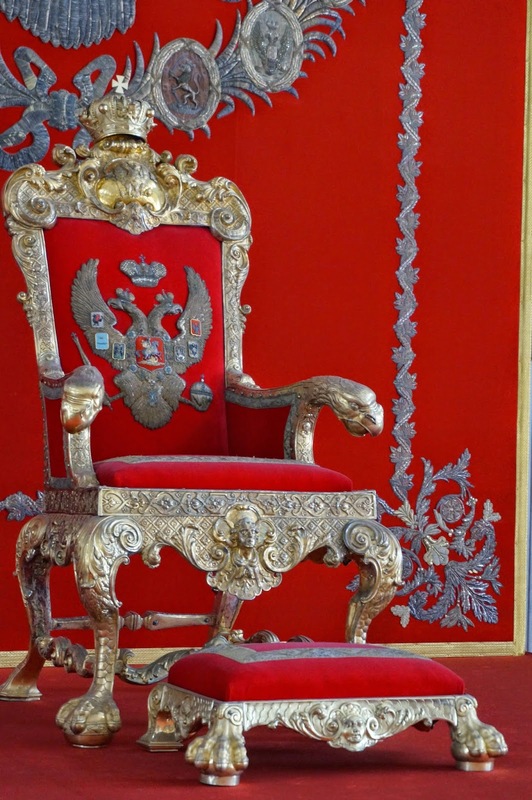 And don’t forget the Romanovs’ private theater. Swan Lake was stunning. Not bad for my first ballet. You have an idea that this is a special “throne,” no? I think it could do with a bit more decoration, and can you ever really have enough gold? Well…not everything is gold. 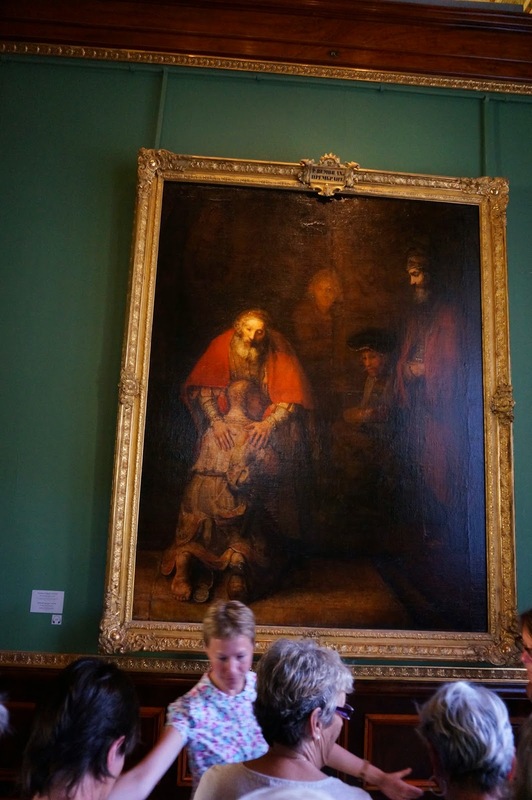 But you have to admit the way Rembrandt captures the light on this father and son reunion is pretty golden. And so is the frame. And these guys aren’t too golden, but they are pretty badass nonetheless. And as you can see, I started to get a little woozy after bathing in all that is good Russian art for, like, 8 hours in a row. I in fact wondered if they were the 4 horsemen of the apocalypse. And then I knew I had to head for the exit when I saw this wonderful scene take place. 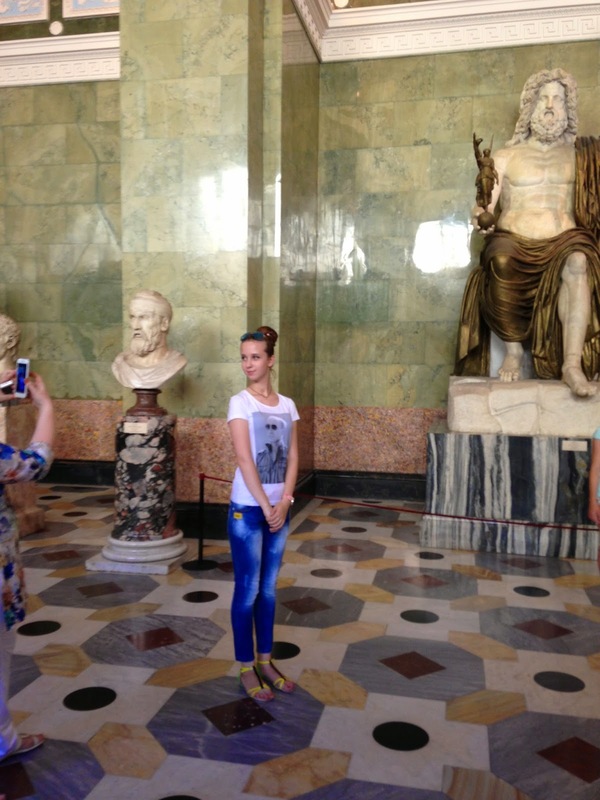 I really love the way this pretty young lady is posing for the picture her mom is taking of her in front of yet another larger-than-life statue that’s quite en vogue in St. Petersburg. But who cares about that old block of stone. I love the profile. And the turned head. And the Mona Lisa smile. And the “acid washed” jeans. But what really compelled me to take this picture was her t-shirt. She’s rocking a picture of Putin wearing sunglasses. I know that Russo-world politics is all screwy these days (that I’ve in fact been quite oblivious to), but in Star Wars-weird Russia, getting your picture taken by your mom in front of a larger-than-life statue of a shirtless, bearded tough guy with a photo of Vladimir Putin rocking a pair of sunglasses is very, very right. After stumbling out into the bright Baltic light and making my way to the Metro stop near the Winter Palace, I encounter this wonderful woman. Several crews from the rally were making their way back to the marina on #7 electric bus and she’s in charge of the tickets. It was hot. But you can see she’s smiling. She wanted to make sure we were on the right tram and that we knew where to get off. She just seemed to be a real nice mom making a living in the big city. But as we approached our stop at the end of the line, she sat down. And as she stared out the window I couldn’t help but notice that her eyes were starting to well up. And then a single tear rolled down her cheek that she absentmindedly brushed away. It’s hard to describe but I was overcome with a profound sense of compassion. Of course I had no idea what she was thinking of at that moment but all I thought to do was to help and give her a hug and tell her it was going to be okay. But then the chance passed. Our stop came. She smiled and motioned to us that this was our stop and we were gone. Traveling to Star Wars-weird places on fine Danish yachts with a fantastic Swedish couple is cool.